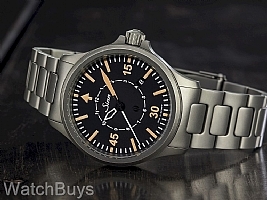 This watch is fitted with a Sinn fully Tegimented stainless steel bracelet. Verified Owner Comments: First, let me take my hat off to Watchbuys! Great, great customer service!!! My latest purchase was the Sinn 856 B Uhr. I am 6' 3 and I am an avid runner. 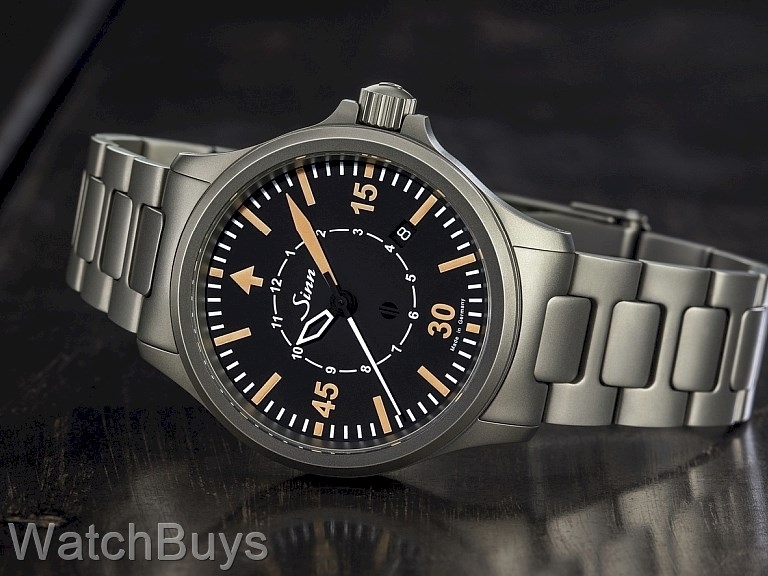 This watch is perfect in size and weight, easy to read, and has many of Sinn's technologies Incorporated. I love Sinn's choice to use the white and parchment colors (looks like a light shade of orange to me.) This really makes the watch stand out! I have had many compliments! "856 B-Uhr on Tegimented Bracelet"
Verified Owner Comments: Love this classic design, esp. with the Ivory contrasts. Looks great with Tegimented bracelet. Easily converts to a strap for dress, formal wear. The 856 case construction is outstanding & perfect size at 40mm. "Sinn 856 B Uhr on Tegimented Bracelet"